Free radicals and antioxidants are like the classic hero/villain struggle. 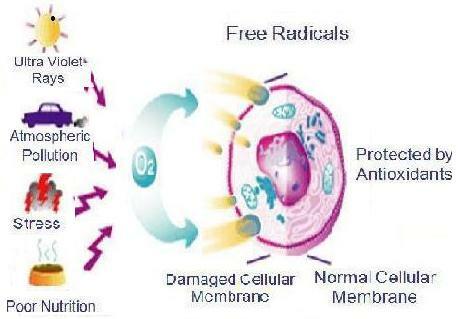 Free radicals are the "bad guys", destroying the cells in your body constantly. Antioxidants are the superheroes that protect you from the bad guys. A free radical is an atom or group of atoms with at least one unpaired electron. In the body, it's usually an oxygen molecule that has lost an electron and needs to stabilize itself by stealing an electron from a nearby molecule. That's called oxidation. Why is this a problem? Whatever the free radical touches first (and steals the electron from), is wrecked. If it's the cell wall, the cell dies. If it's the DNA, it causes a mutation- that leads to many diseases, especially cancer. 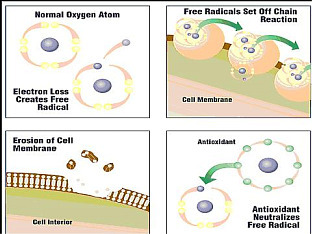 Free radicals only last for a tiny fraction of a second, but during their fleeting existence, they cause some serious structural damage to your cell. They often leave a huge path of destruction in their wake. Once a molecule is oxidized by the free radical, it often starts a chain reaction of oxidation until an antioxidant can stop it. That's why free radicals and antioxidants must go hand in hand. Think of free radicals like sparks from a fireplace and your body is the carpet around it. When a spark flies out of your fireplace and lands on your carpet, it leaves a little hole where it landed. After a few years, your carpet is going to be looking pretty ratty, right? Well, antioxidants are like the screen on the fireplace- they stop the free radical before it can cause any damage. That's why it's so important to balance your free radicals and antioxidants. 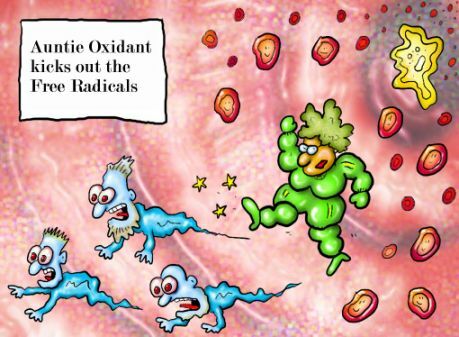 Bruce Ames, a well-known scientist in the field of antioxidants, estimates that just one cell in the human body is hit about 10,000 times a day by a free radical. If you multiply that by the trillions of cells in the body, the damage potential is huge. Think of all the symptoms you normally associate with aging- decreased mobility, mental function, aches and pains, wrinkles... you name it. Now think of any disease- heart disease, diabetes, arthritis, cancer, Alzheimer's, Multiple Sclerosis... just about any disease you can think of. Scientific studies now show that all of those symptoms we normally associate with aging, as well as just about every disease there is, are caused by the damage of free radicals on your body. Dr. Denham Harman proposed this theory back in 1954. It was a radical theory (pardon the pun) back then and pretty much ignored until the late 1960's, when several scientific studies proved him right. Since then, over 80 degenerative diseases have been linked to the consequences of oxidative stress (that's what they call the damage from free radicals). Scientists now believe that all these degenerative diseases are not really separate things after all. They're just the different ways of your body expressing the results of your genetics, environment and lifestyle. If you think about it, it makes sense. Why are smokers more likely to get lung cancer, asthma and COPD? Because smoke is a major source of free radicals. Where do these free radicals come from? Stress- both physical and mental. Ironically, those who exercise too much are actually increasing the oxidative damage to their bodies. That's why you hear about the marathon runner who drops dead of a heart attack. Don't use this as an excuse to not exercise though :) Moderate exercise is of course good for you. Your own body- yes, just the act of breathing and creating energy for your body makes free radicals. So, you can see you can't possibly avoid free radicals. All you can do is make sure you have enough antioxidants to minimize the damage. Free radicals and antioxidants are in a constant power struggle. I guess I shouldn't make free radicals seem completely evil. They're not entirely bad. Aside from the fact that they play a key role in breathing (a rather important bodily function), they also have some other key functions. They're important to your immune system- they're actually partly responsible for killing the bacteria and other invaders of your body. They also help start the inflammatory process that helps repair injury. Free radicals and antioxidants are both important to your health. The key is to balance the two.